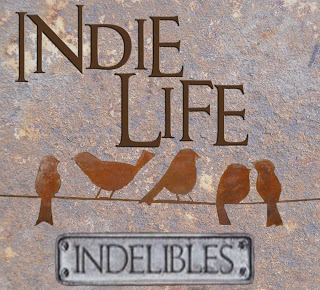 Welcome to my Indie Life post for July. This is a monthly feature posted on the second Wednesday of the month and hosted by the Indelibles. The aim is to promote, encourage, and support indie authors. Last month I told you all about the awesome Lawrence Mann and his awesome art. Well, two days ago I got the best email in the history of emails in my inbox. Ever! It was the final illustration for the cover of my current WIP. I still don't have the right words to explain how happy I am about this JPEG file, because I'm convinced the word(s) I'm looking for just don't exist. This is the best part about being an Indie. The little (or in this case pretty big) things that when put together with other little (or big) things, make up the whole. And the knowledge that I must be doing something right. I put my faith in someone else and boy has it paid off! I haven't released any details about this current WIP (because I'm mean) but, I can tell you there will be a cover reveal happening on August 23rd with Xpresso Book Tours. Details for the book will be released by the end of July. I'd love to hear about your cover experiences. What was your reaction when you first saw your book's cover? Let me know in the comments. Until then, keep being the awesome Indies that you are. PS: I'm having a rather bracket-y kind of day. Usually it's the em-dash, but I thought I'd go with brackets this time. I know what you mean! I'm a cover designer and I usually design my own covers, but this one is illustrated so it was out of my expertise. I'm so glad I asked someone else to do it. Thanks for stopping by. Covers are one of the best parts of being indie! I think the thing I like best is how readers react to my cover. Very exciting about your new cover leaving you speechless. I'm excited to see how it turned out in August! I'm excited to show everyone! Thanks for your comment.